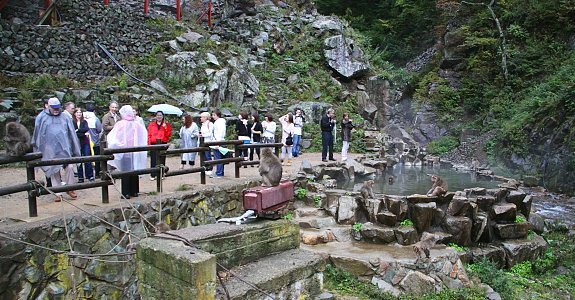 The Jigokudani Monkey Park offers visitors the unique experience of seeing wild monkeys bathing in anatural hot spring. The park is inhabited by Japanese Macaques, which are also known as Snow Monkeys. 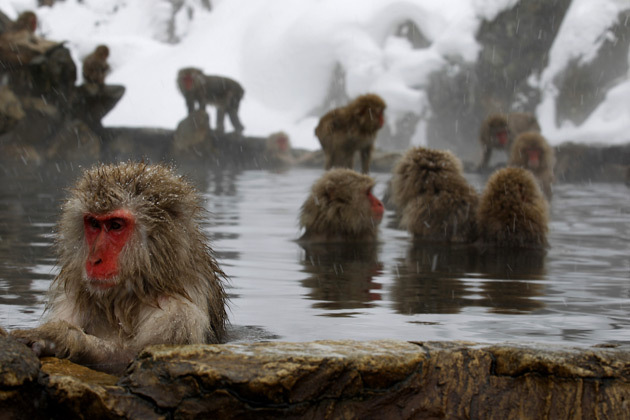 It is located in the monkey's natural habitat, in the forests of the Jigokudani valley in Yamanouchi, not far from the onsen towns of Shibu and Yudanaka. The park has one man-made pool around which the monkeys gather, located a few minutes' walk from the park entrance. Visitors will likely already encounter monkeys along the path to the pool. The monkeys live in large social groups, and it can be quite entertaining to watch their interactions. Accustomed to humans, the monkeys can be observed from very close and almost completely ignore their human guests. Naturally, it is prohibited to touch or feed the monkeys. The park has a small information center with information mostly in Japanese. However, there is a small explanation of the alpha male system of the monkey troop in English, as well as portraits of the park's present and former alpha males, dating back dozens of years. There is a live camera beside the monkey pool that is accessible online. Although the park is open all year round, the bathing monkeys are particularly photogenic when the area is covered in snow. There is usually snow in the region from December to March, and the best timing for a visit is January and February. Monkeys enter the bath around the year, but they sometimes need some encouragement to do so by park wardens throwing food into the pool, especially during the warmer seasons of the year. Jigokudani, in which the park is located, means "hell valley" and is a common name for Japanese valleys with volcanic activity. Although its landscape is not as dramatic as some of Japan's other jigokudani valleys, Yamanouchi's Jigokudani does produce a few steaming hot springs. There is a ryokan called Korakukan in the valley, which visitors will pass along the way to the monkey park.